Will the Gray Lady Commit Hari-Kari over Assange? Timm interviews James Goodale, the former NY Times lawyer who insisted, correctly, that publication of the Pentagon Papers would enjoy 1st amendment protection. Will the NYT now make an exception for Julian Assange, and thereby set “an incredibly dangerous precedent?” And is today’s legal profession so cowed by the Deep State, as to enable suppression of the press — as in Germany 85 years ago? Goodale points to the huge stakes involved in a step that would emasculate the 1st amendment that Jefferson, Madison, Mason, and other Founders saw as the core protection of our freedom. 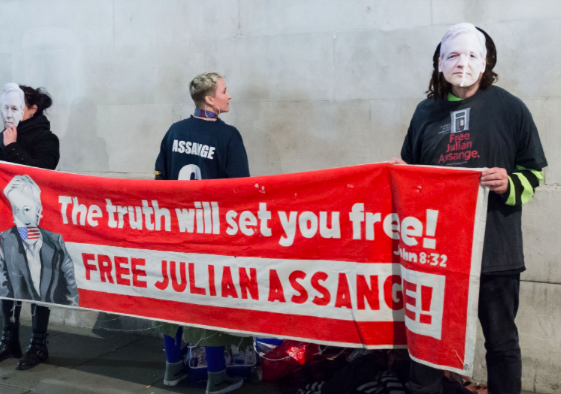 What seems about to happen has implications far beyond the unseemly effort to “get” Assange, and to hold his case up as a high-profile object lesson as to what government is now able to do — given the widespread abdication of responsibility on the part of co-opted lawyers and timid journalists. ← Who’s in Charge in Washington?